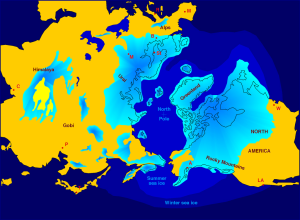 "Ice Age" refers to the Pleistocene epoch, which ended between 13,000 - 9,000 years ago. He Pleisticene epoch was the most recent period during which the Northern Hemisphere was covered in advancing and then retreating sheets of ice, otherwise known as glaciers. During the late Pleistocene epoch, Paleoindians moved through areas of what is now known as New Mexico, although evidence of their hunting camps grows scarce the futher one travels west beyond the Rio Grande Basin. "Northern hemisphere glaciation during the last ice ages" by Hannes Grobe/AWI is licensed under CC BY. 1973 The Hunt for the Lost American. In The Great Taos Bank Robbery and Other Indian Country Affairs. Pp. 52-75. Albuquerque: University of New Mexico Press." 2005 Ice-Age Peopling of New Mexico. In New Mexico's Ice Ages. Spencer G. Lucas, Gary S. Morgan, and Kate E. Zeigler eds. Pp. 263-276. Albuquerque: New Mexico Museum of Natural History & Science, 2005."